The cosmic code of the Book of Change (Yijing) was recorded by simple-minded ancients, who observed the integrity of all aspects of life, discovered the laws behind the diversity of nature, and created a way of harmonious living with nature. Nature was their teacher. By embracing the patterns of nature in the center, their philosophy, they were able to make their lives predictable. Once the center is found, completeness is accomplished. The fundamental principles of the Yijing have guided philosophers, politicians, mystics, alchemists, diviners, scientists, and mathematicians. The main idea of the Yijing is to be firm in yielding the mind. 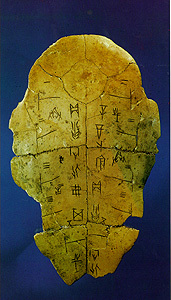 The Yijing reveals the science of divination and the art of philosophy through an intricate mathematical cosmology that forges astrology and geomancy into the heart (which governs the body, expresses through the face, and projects through the palm) of humanity, which learns to understand the truth of reality. The cosmic code of the Yijing oracle reveals prophetic messages, which guides humanity back to divinity by following the way (truth) of nature (neidan). The unchanging truth of heaven is that everything under it changes. The Yijing is discussed in terms of history, systems, mathematics, fundamental concepts, sixty-four hexagrams, coin and yarrow stick methods of hexagram divination, plum blossom numerology, astrology, and the genetic code. Please donate to the Bone Oracle (clicking 'ADD TO CART' IS 64 cents).